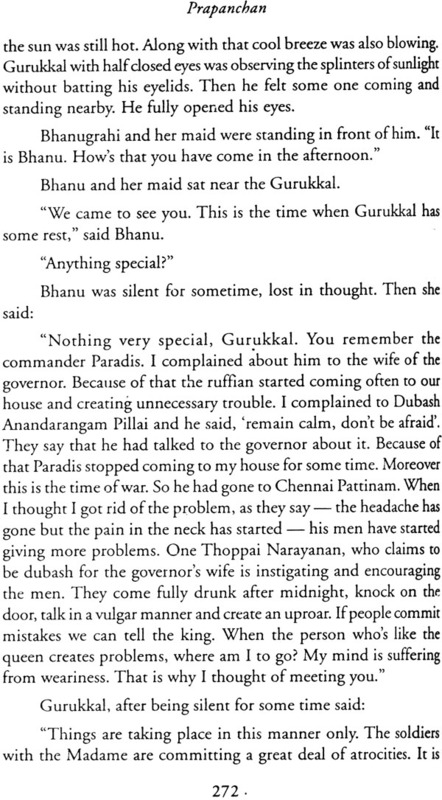 Beyond the Sky (Vanam Vasappadum) encapsulates the founding, consolidation and collapse of the French colonial venture in India with Puducherry (Pondicherry) as its centre. 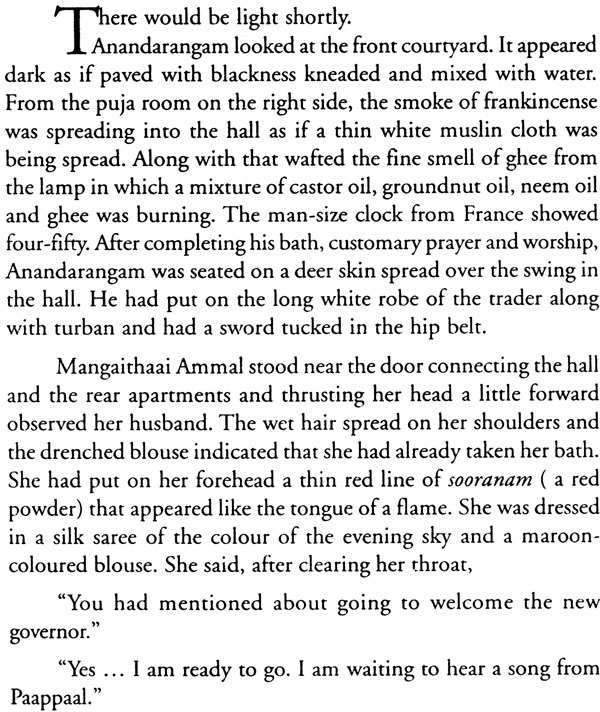 Oscillating between the period 1740 and 1750, the novel brings history and fiction together to produce an intriguing narrative of the French empire envisaged through the diary of Anandarangam Pillai, the dubash for the French government in Puducherry. What unfolds is not only a slice of history but also the various facets of human nature under the colonial regime of the French empire. 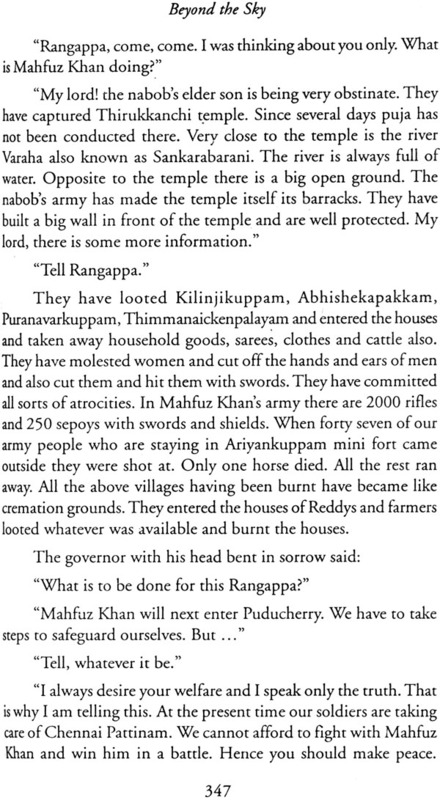 The novel is considered to be a major contribution to the genre of historical novel in Tamil literature.The novel won the Sahitya Akademi Award in 1995. Prapanchan was born in 1945 in Puducherry. He has published 18 collections of short stories, 14 novels, one novelette and one collection of play. He has been honoured with several awards and honours including the Tamil Nadu Government’s Best Writer Award for the years 1982 and 1986 respectively. He was also awarded the Pondicherry Government’s Best Writer Award in the year 1986. A number of his works has been translated into Indian languages, English and French. P. Balasubrainanian (1933-2007) taught Tamil and Comparative Literature at Delhi University from 1965 till his retirement in 1997. Apart from it Dr Balasubramanian brought out a scientific journal Anukkadir for a year in the 1 960s. He has translated widely from Telugu, Tamil and English. Two of his short story collections Muthu Chippi and Kaalathai Vendra Katanga were published by Papa in 2000. This is my second historical novel pertaining to the eighteenth century. Manudam Vellum (Humanism Wins) was my first work. Vanam Vasappadum (Beyond the Sky) is being published now as the second novel. ‘When the British imperialists were attempting to bring India under their control, with all the weapons at their disposal, the French imperialists were successfully implementing it. The French governor Dupleix set the precedent and gave indirect guidance to Clive for establishing a united British India. The French emperor Louis the XIV set up a trading company for engaging in business activities in the Far East on August 27, 1664. 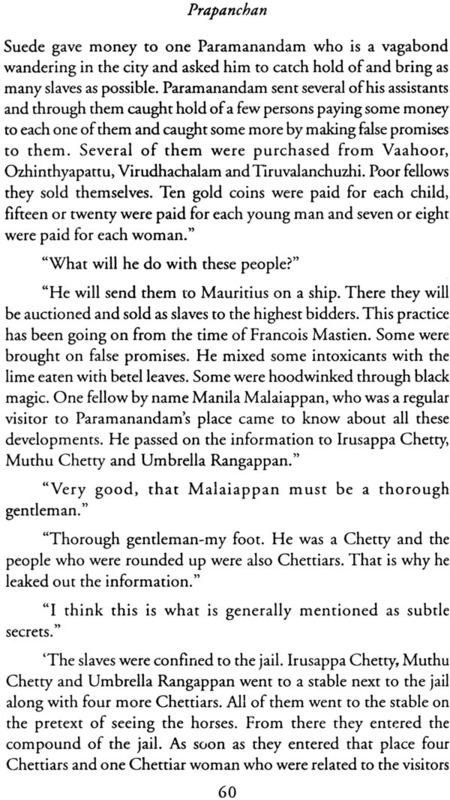 Belangear was the first French trader to set his foreign foot in the soil of Puducherry (Pondicherry) on February 4, 1673. Puducherry was made the capital of the French colonies in India in 1701. During the governorship of Dupleix (1742-52), Puducherry earned the distinction of being the political capital of South India. The Nabob of Arco and local Maharstata kings were under Governor Dupleix’s control. In a way he was recognized as the Nabob of South India with an area extending from the river Narmada to Cape Comorin. 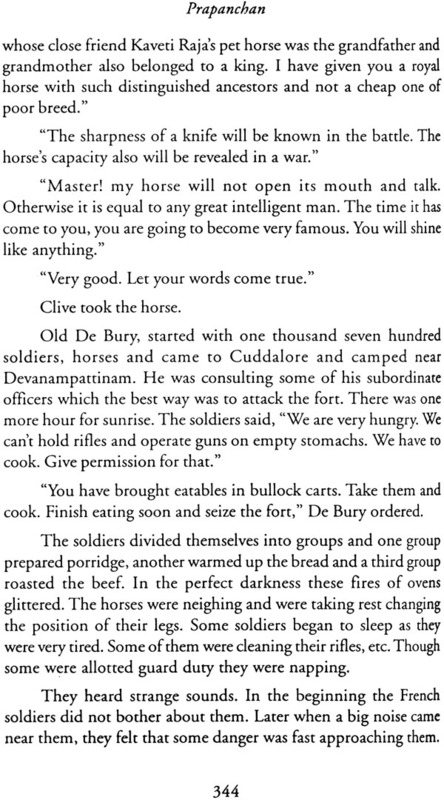 It was Dupleix who taught the British imperialists that it was quite easy to make India a part of the British Empire. Dupleix succeeded in bringing a major part of South India under the French Empire. But the cycle of hIstory took a different turn in the course of time. 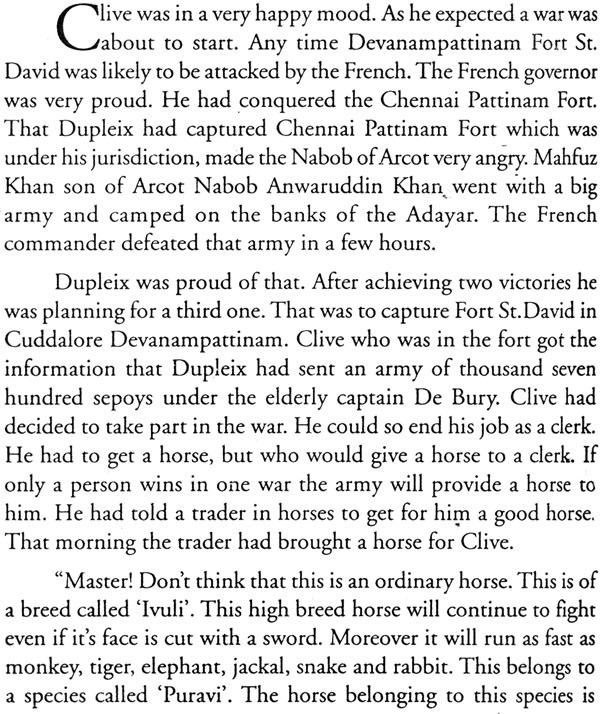 A Britisher named Clive arrived in India to dispel Dupleix’s dream of establishing India as a part of the French Empire. Apart from that it is a historical fact that empires do not continue to exist forever and change hands from time to time. A French historian has written that Dupleix had four wings in his army. They were 1. infantry; 2. cavalry, 3. artillery and 4. deceit. Dupleix succeeded in his war efforts with the fourth wing only. The Indian kings were embodiments of treason: treason against language, against their own kith and kin, against brothers and against the State. Treason was their political creed. Still Dupleix lost in the end. The primary reason for his losing was that the British had a mighty navy, which Dupleix did not possess. The second important reason was that the French Company did not have the executive independence that the British Company enjoyed. 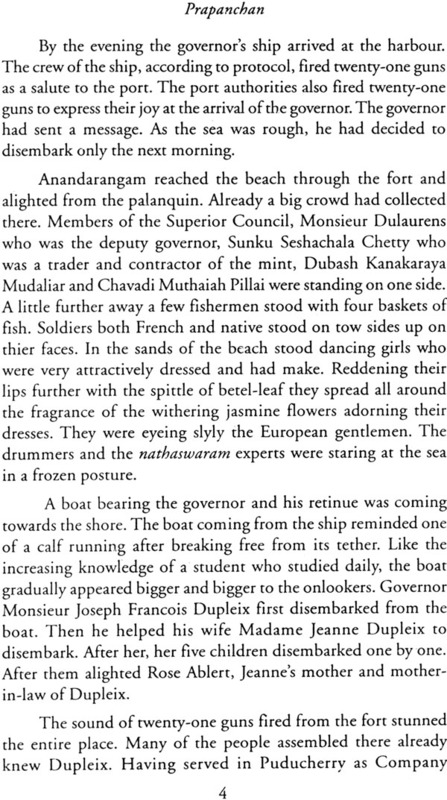 A Tamilian Aandarangam PiIlai was dubash for the French government in Puducherry under Dupleix and also under his successor. His power, as an official, was only next to the governor. He was a lover ofTamil literature and a patron of poets and scholars. He was quite famous in his days. But his fame rests in the fact that he maintained a diary for twenty-five years recording all important political and social events. 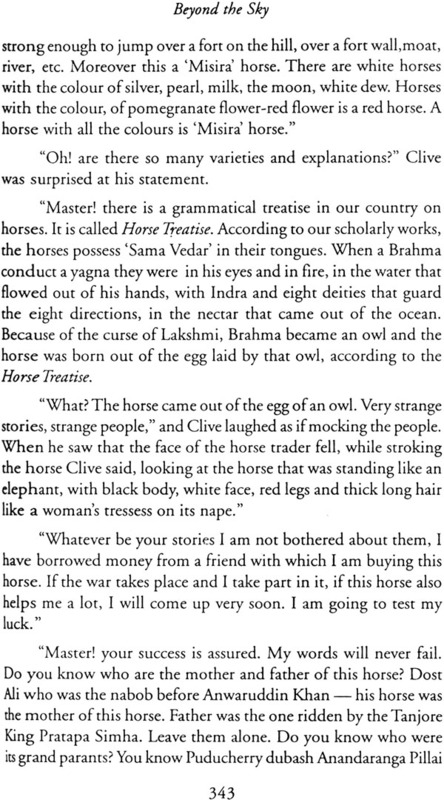 We are able to understand the eighteenth century mainly because ofAnandarangam Pillai and later because of Veera Naicker. I made use of Mr. Pillai’s diaries. 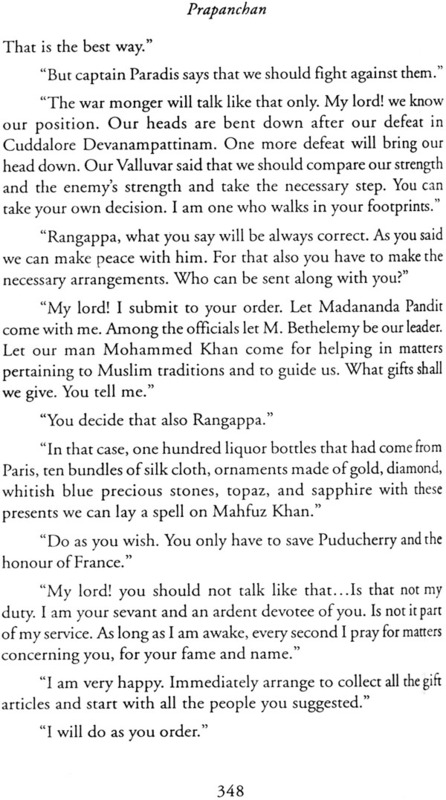 Along with those diaries I utilized works pertaining to the histories of the Marattas, the kings of Madurai and the Delhi Sultans for writing this novel. The other component in this work pertains to human nature. Human nature is the basic theme in all creative works irrespective of the period of language in which they have been written. Form and technique may change. But there is no exception regard to depicting human nature. I was interested in analyzing how human nature played its role among the Europeans who arrived here, after traveling six thousand miles and also that of the Tamils and others who were sons of the soil. It was very interesting for me, particularly to analyze the thoughts and activities of the people who lived two hundred years earlier. Looking back at events that took place earlier, by itself, is not history. The people who were responsible for the events possess a great deal of information to be passed on to the people of our time. I utilised the language of their time for this purpose. My desire to present the life and the language of those people took shape in the form of this novel. You can assume that this novel pertains to the period 1740- 50. 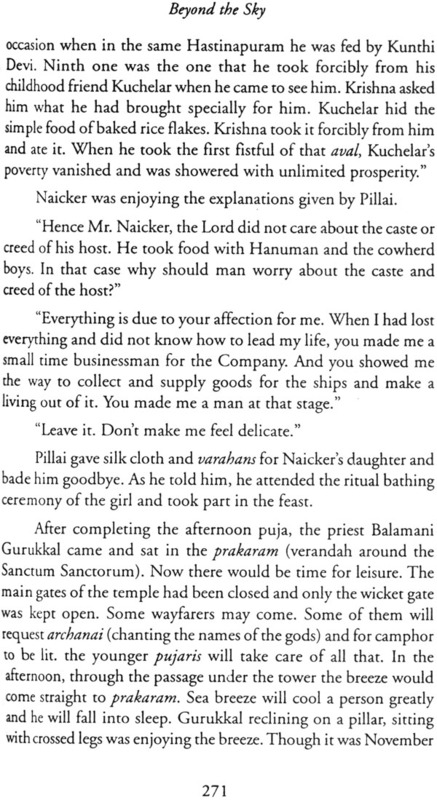 I am yet to write about the last days of Anandarangam Pillai and Dupleix. 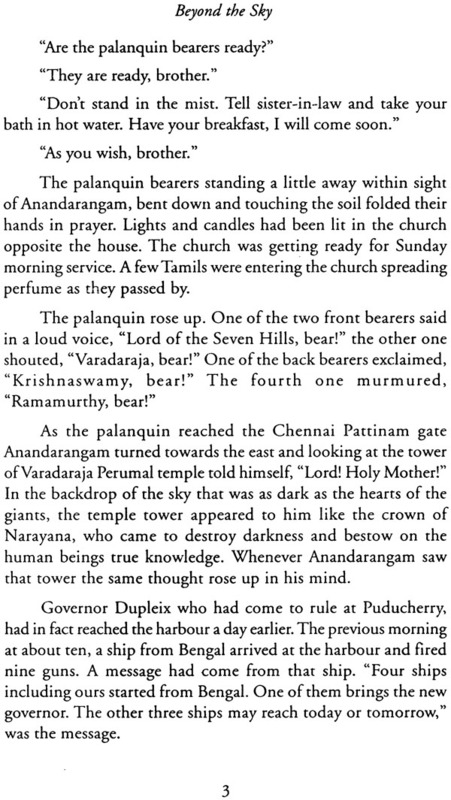 As a sequel to that I have to present the struggle for the independence of the people of Puducherry, about the heroes. of that struggle and the traitors who tried to sabotage it but failed. I express my gratitude to Mr. Kasturi Rangan, the Editor of Dinamani Kadir and his deputy Mr. Tiruppur Krishnan for serialising this novel in that reputed journal. I also express my thanks to Mr. Sudaangan who took charge of the journal during the period when the final part was being serialised. I also express my gratitude to the artist, Mr. Maniam Selvan who contributed eye-catching pictures for the serial. He also hails from Puducherry. That probably inspired him to take extra interest in making the pictures very attractive. I express my sincere gratitude to my friend, Mr. Sethu Chokkalingam who took pains for publishing this novel in an attractive manner. 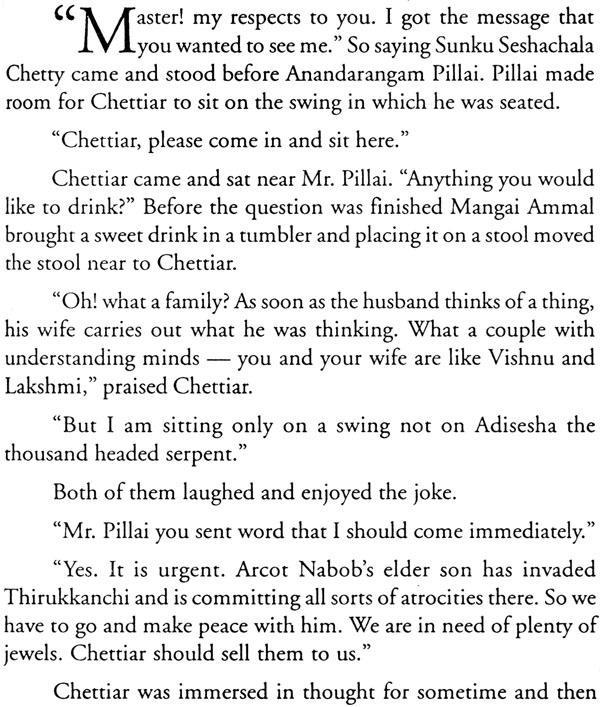 Historical novels in Tamil are generally historical’ in name only. A part of their content is history and the rest fiction. In some of the novels, the twentieth century has been transposed to earlier times and the names of some of the rulers and few of the events that took place in that period are cited to give a historical colour. 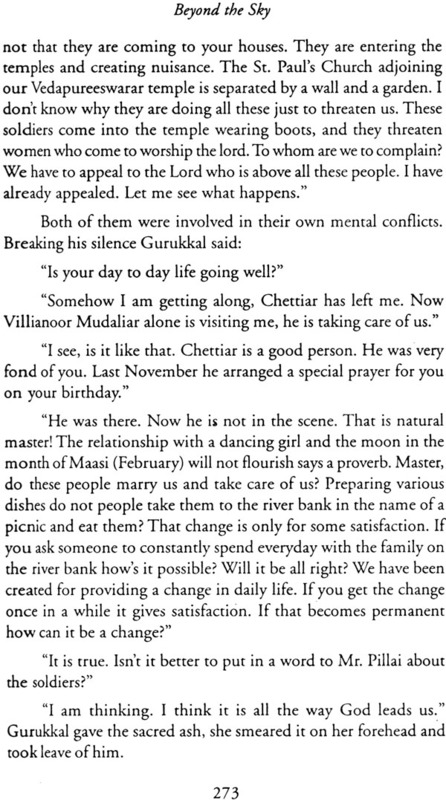 But the novel Vanam Vasappadum (Beyond the Sky) is an historical novel with a difference. It is based on the diaries maintained by Anandarangam Pillai for twenty-five years. Mr. Pillai was Chief Dubash for the French government in Puducherry (Pondicherry), serving under governor Joseph Francois Dupleix and his successor. This novel mainly focuses on the time of Dupleix (1742-52). His attempts to bring India, particularly South India, under the French Empire are depicted in a matter-of-Fact style. His successes and failures in these attempts are presented in a graphic manner. True history should not be restricted to the exploits of rulers, their wars of succession, expeditions, battles waged by them with the neighboring states, etc. but should present the life of the people of the period. In that respect, it can be said without hesitation that this novel depicts the social and religious life of the people. The beginnings of Christianity in French India, the attempts made by the pastors to uplift the downtrodden and also their zeal to spread Christianity; to the extent of demolishing Hindu temples close to the churches, are recounted. The demolition of the Vedapureeswarar temple — the oldest temple in Puducherry adjoining St. Paul’s Church is a stark example of the bigotry of Christian missionaries and Christian governors. Another interesting fact that emerges from this novel pertains to the social life of the native Christian converts. Caste was a dominant factor even among the converts. There were separate enclosures for accommodating the high caste Christians and the untouchable converts in the churches during mass or other services in the church. Similarly it is interesting to note that Christian widows were treated in the same manner as Hindu widows. They had no right to inherit the property of their husbands if they had no sons. The property was inherited by the dead man’s brothers or first cousins. Their daily life was no better than that of the Hindu widows in being served salt less cooked rice twice a day, a mat to lie down and sleep and two sarees in a year. As a student of Tamil Literature, History and Anthropology, I learnt many interesting facts while translating this novel. 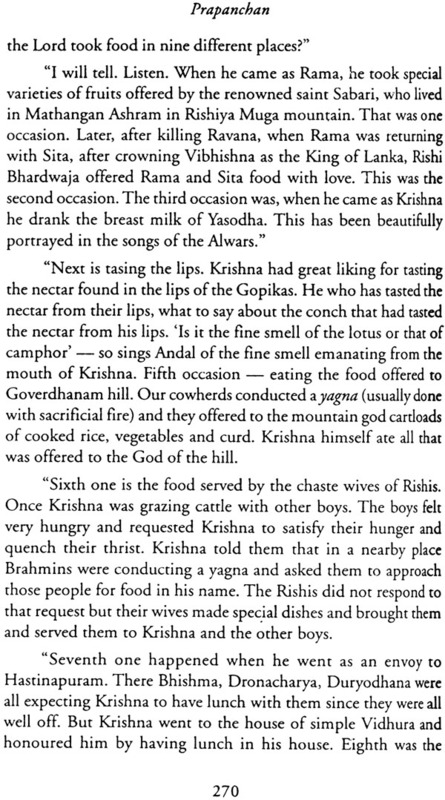 For instance, graphic accounts are given about the devadasis, dancing girls who served the temples for a pittance and hence were forced to rake to prostitution to earn their livelihood. Innocent and poor’ people and expelled criminals were taken more or less as prisoners by some of the foreigners and sent to distant places like Mauritius, Manila, etc. and sold as slaves to the estate owners there. 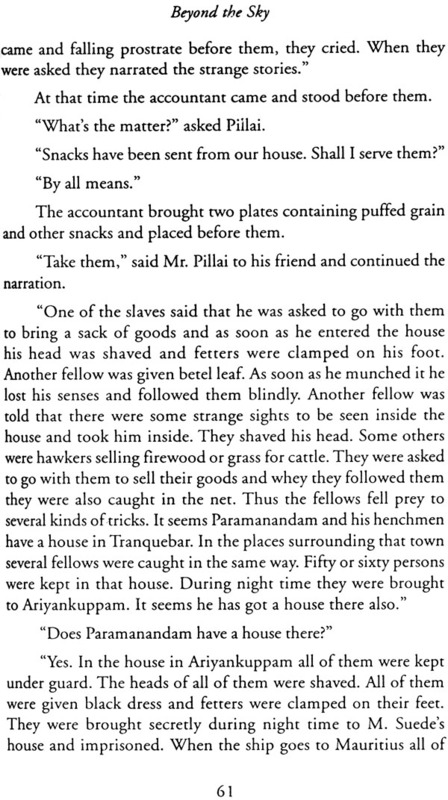 A bonded labor was a dominant feature among the landed gentry in Tamil Nadu. The laborers were treated like animals and the punishments meted out to them for even minor offences were inhuman and unimaginable. 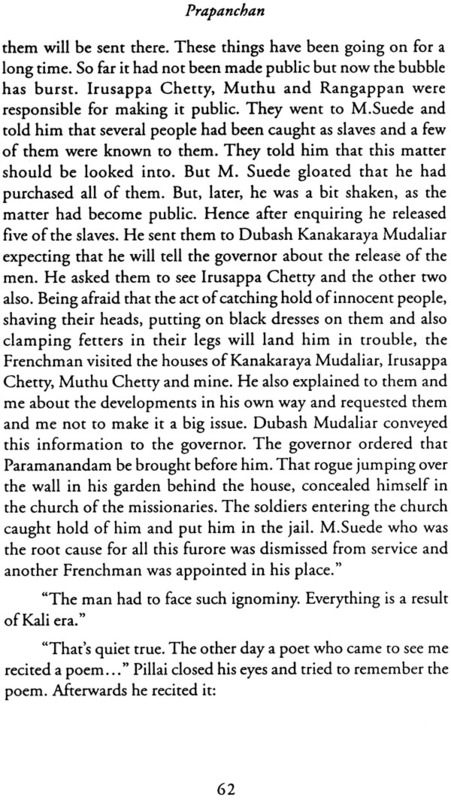 Some of them somehow managed to escape from their cruel masters, fled to Puducherry, which was French territory, embraced Christianity and were able to lead a somewhat peaceful life there. Girls were married before they attained puberty, generally before they were twelve years old. Child marriages were also prevalent. It is interesting to note that the author has presented these and several other such interesting facts without any bias. 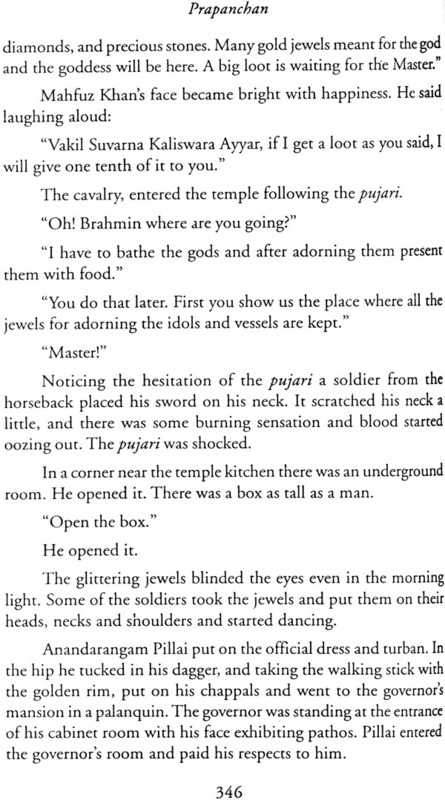 Deservingly, this novel was presented an award by the Sahitya Akademi a few years ago. Like other works that receive the awards from the Akademi, this novel has been translated into several Indian languages. I was entrusted with the task of translating it into English. I sincerely express my thanks to the authorities of Sahitya Akademi and the concerned Advisory Boards for selecting me to do this onerous task.